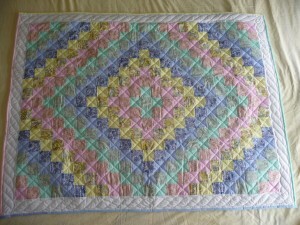 Handmade Amish baby quilts in vivid colors and varied patterns for sale. The Amish call their infant quilts and baby quilts “Crib Quilts.” Each Amish baby quilt is unique and hand quilted by one person. All of our baby quilts are made of 100% dye fast cotton fabrics. As with many cultures, the Amish believe that it’s important to provide a handmade gift to a child. This will bring that child health and happiness in his or her lifetime. It’s no wonder that Baby Quilts are prized possessions within Amish communities. Or, that so many of us still have our keepsake baby quilts and baby blankets well into adulthood. 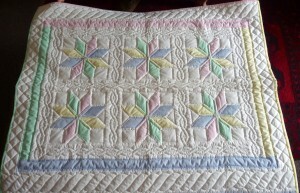 Our baby quilts for sale include traditional Amish patterns such as the Double Wedding Ring, Log Cabin and 9 Patch as well as colorfully embroidered baby quilts that depict baby animals and children. 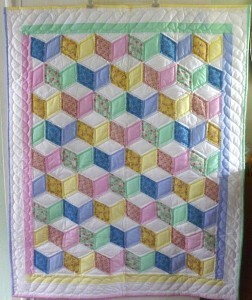 Examples include our Noah’s Ark quilt, Sun Bonnet Sue quilt and Overall Sam quilt. 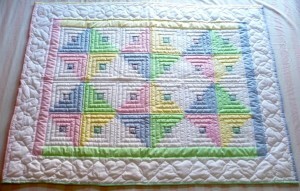 We invite you to view all of our Amish Baby Quilts. Take your time, have fun, bring a piece of art into your baby’s room with our beautiful and authentic crib quilts. Also for baby’s room, you might like to consider a handwoven Amish Rug. Click HERE to view our selection of Amish made scatter rugs.